In a previous post, I nominated 1997 as perhaps the worst ever draft class of wide receivers. However, there are a few other really poor classes. 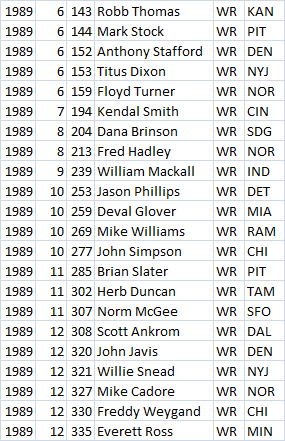 Today we look at the 1989 group, a class of 40 receivers over 12 rounds. Dykes showed promise early, hauling in 49 catches for 795 yards his rookie year. He was on pace to top those numbers in 1990 when he shattered his kneecap (ending his season) and then injured his eye in a barfight with teammate Irving Fryar (ending his career). Drafted by the Colts, he was traded to the Falcons after his rookie season. Rison had a great 5 year run with the Falcons- averaging 83 catches and 1127 yards per season. Once he got out of the Run-And-Shoot and headed to the Browns, his career faded quickly. 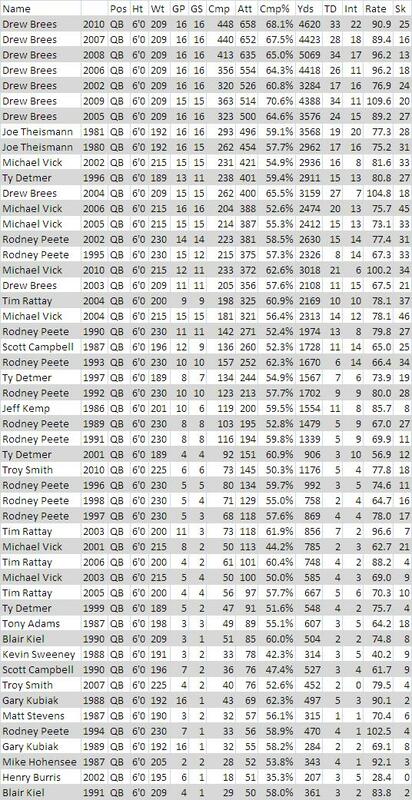 He put up only 268 catches for 3752 yards, spread over 5 different teams, in the 6 ensuing seasons. Shawn Collins was a bust, catching 92 passes over his first 2 years (in that very same Run-And-Shoot in which Rison found success) and had only 6 catches the next 2 years before falling out of the league. Beebee was a solid complement to James Lofton and Andre Reed in the Bills’ Super Bowl (losing) teams of the early 90’s but he never had more than 40 catches in a season. 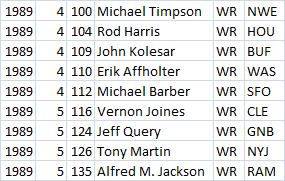 The other 5 receivers accounted for a cumulative 118 catches for 1859 yards in 125 career games. Hill, Worthen and Ford were all out of football by 1991 and Peebles by 1992. Timpson played for 8 years, totaling 300 receptions for 4047 yards. Tony Martin is the 2nd best WR to come out of the 1989 draft (behind Rison). Picked up off waivers by the Dolphins, he ended up stuck behind guys like Mark Duper, Mark Clayton and Irving Fyrar. He didn’t get a chance to shine until he went to San Diego in 1994, putting up an impressive 288 catches 4184 yards and 33 TD’s in 4 years with the Chargers. He finished his career with 593 receptions, 9065 yards and 56 TD’s – one of the better careers for a WR drafted so late. 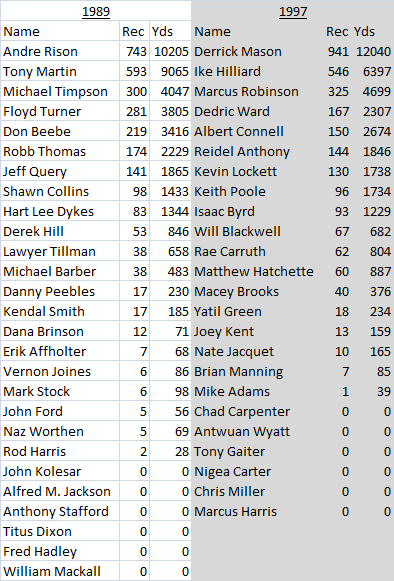 Query is the only other guy from that group who had more than 100 career catches (141 in 6 years). Floyd Turner was a quality #2/#3 WR for a few years and Robb Thomas hung around for a long time as a #4 WR who excelled on special teams. None of the others had even 50 career catches. Derrick Mason (1997) is better than Andre Rison (1989) as the top guy in each class. Each class had one quality first rounder (Rison and Ike Hilliard) and nothing else before the 4th round. 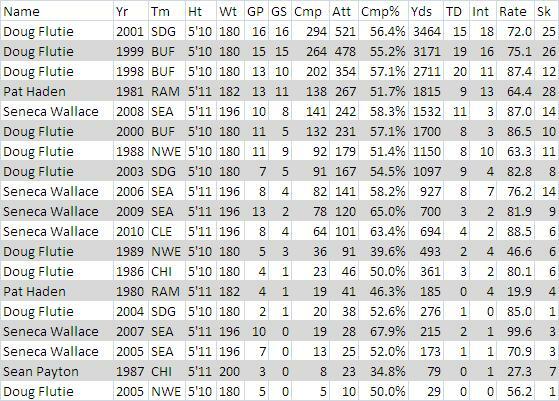 Overall, 1989 is probably a bit worse if only because Martin and Rison had shorter periods of success than Hilliard and Mason. Yesterday I discussed LSU CB Tyrann Mathieu’s size (or lack of) and how it could affect his draft stock. The conclusion was that there’s a good chance he could overcome his small stature and become a productive NFL player. However, size matters at some positions more than others. 2012 QB prospect Russell Wilson is a good example of a successful college player who is almost certainly too small to succeed in the NFL. 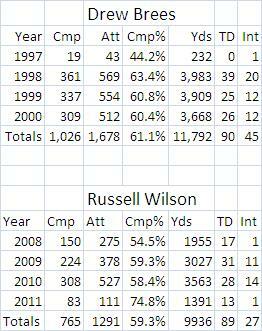 While Wilson’s performance has been pretty similar thus far, it should be noted that it’s rare for a top NFL QB to ever post a <60 Cmp% in college. That he hasn’t hit that benchmark until this season could spell trouble for him if he even gets a shot in the pros.